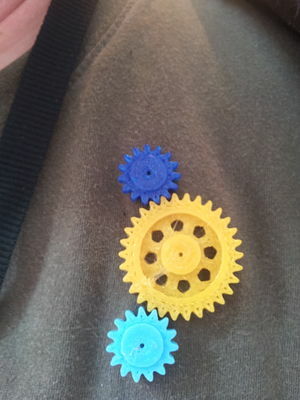 Inspired / Forked a Thingiverse object with two gears that, with the use of magnets, hold onto a backplane behind fabric enabling free rotation on for example a t-shirt or other clothing. I extended the thing in OpenSCAD to have three gears instead of two, under a 135 degree angle. We've created these in many (>6) colors on the Cerberus delta and sold these, starting at HITB 2015, and beyond. 1) Give credit/link to original thingiverse here. This page was last edited on 17 August 2016, at 17:13.